Got my calls this morning and absolutely love the sound. I cannot wait to get them in the woods. Thank you and I believe these are the best, most realistic calls I’ve ever had. Thank you! Introduced to this call 12 years ago. Been hunting turkeys for 45 years. Cane Creek Calls are my favorite. Thanks for making such a terrific call. Been using these calls since the first Pro Custom glass that was set in poplar with a hickory striker. Yesterday I ran a bunch of different glass calls from well known companies, never found one that could touch Cane Creek . 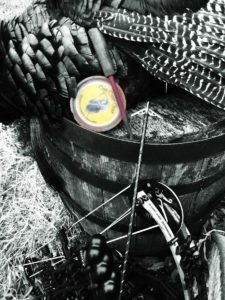 Called in my first turkey 20 years ago with a Cane Creek mouth call they are the only calls I use. I don’t leave without my Mr Death and Cane Cutter in my vest. They sure have retired a lot of long beards for me and people I’ve guided. Thank you guys for the best product in my opinion out there. Hello Doug, thought I would send you a picture of one of the birds I shot last year using your calls. One of those calls was the Pro Slate that survived being under water after Hurricane Katrina for quite some time before I accidentally found it. Works just as good as it did 25 years ago. Best calls on the market, take care Michael Green. I’ve been trying a lot of different calls this year from companies I can’t find in stores based on the fact I’m tired of paying for a name. While they’ve all sounded good both my Cane Creek mouth calls are easy to run and sound absolutely phenomenal. 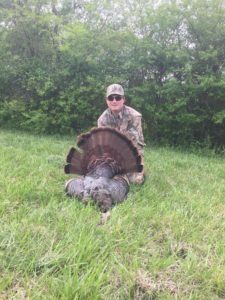 Justyn Potter took these two gobblers during the 2017 spring turkey season. The big toms were lured in with the Reaper slate call. I have been messing around with mouth calls casually for 10 years now, I could never get the sound and consistency that I wanted out of any of the ones that I tried. My Cane Creek Calls order arrived yesterday and within 2 hours I was doing things with a mouth call that I never thought I’d be able to. I would highly recommend Cane Creek Calls, the Lost Poult is very user friendly. For someone trying to learn I would recommend learning on a Cane Creek Call, it will speed up the process. 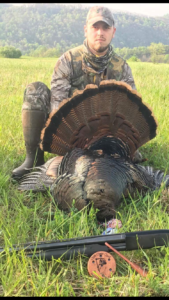 Tagged out in the WV mountains with a good public land bird. 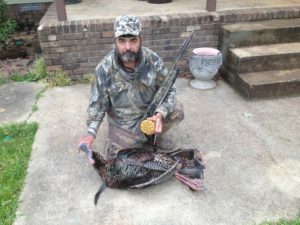 20lbs 1 1/8 spurs 9″ beard. Calls used CC Smoker and Reaper slate. That Reaper Glass Call sure did its job. 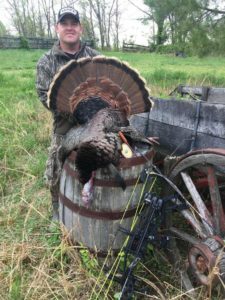 Rod Spittle here from Tremont PA with a 2017 PA gobbler that I harvested while using it. What an excellent call! Want to thank you for your professional service and outstanding products. Doing business with you was such a pleasure and talking to you a plus. The Reaper glass call got this big gobbler into bow range for Ricky Muncey. This is Blake Clark. I ordered some calls from you last week and they came in Friday afternoon, 1 day prior to opening day here in NC. Best mouth call I’ve ever used. Had a bird on the ground before sunrise. 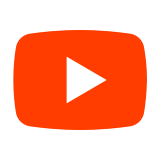 Guys, my name is Richie Roberts I’m from North Carolina and I own Elk Creek Media a online hunting show. I just wanted you to know that I recently purchased your Cane Cutter and Dead End mouth calls. I have been turkey hunting for 25 years and I believe without a doubt that these calls have the most realistic sounds that I have ever made. I have used all the calls out there and want you to know that I am a life long customer. Thanks!! 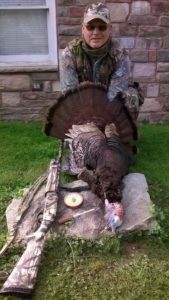 Connie shot this big double bearded gobbler using the Reaper slate call. After testing many box calls in a store here in Cookeville, TN for over an hour I chose yours and never will use a different call. Since then I have limited out for two years and killed big birds every year. 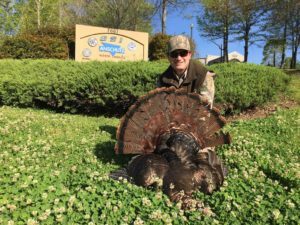 My brothers and friends would try their calls and then I would show them how its done with your cane creek box call. I am getting ready to buy a couple of more in case anything happens to this one. I was referred to purchase your calls by a good friend of mine Mr. Phil Rawlings of Thompson center. I ordered your pro custom glass call last week and it arrived to me in Alabama on Friday night. 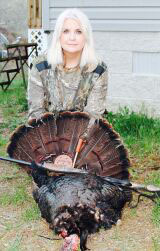 I am no where near being an expert turkey hunter and really have just gotten into the sport. Since getting the call on Friday I have been on 2 hunts where I was doing the calling. The results are in the pictures. I believe you will see some increased orders in the state of Alabama! Thank you for offering such a quality product and I will now be a lifetime customer!